Fifty years ago, police officers seldom carried knives and very little, if any, classes were given in how to counter a knife attack. However, today most officers do carry some kind of edged weapon along with their firearm and there are many training courses on the use of the knife in emergency situations. 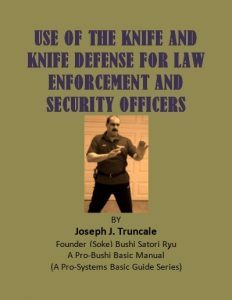 I have been teaching basic knife handling and knife defense techniques to law enforcement and security officers for more than twenty years. The philosophy of Pro Systems and Bushi Satori Ryu has always been based upon a simple principle. In order to understand how to defend against a knife threat or attack, one must learn basic knife handling techniques. The purpose of my edged weapons course was not to make knife fighters of officers, but to emphasize the danger knives pose to law enforcement and security officers.